Did I miss myself today? 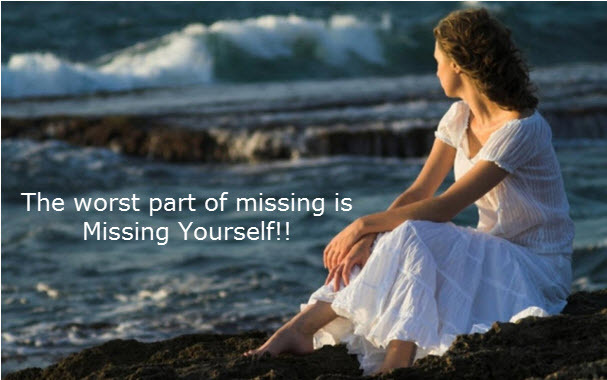 26th November 2016 malinispace6 Comments on Did I miss myself today? Busy day, Busy family, Busy Friends, Busy neighbors, Busy World..
Alarm rings for the third time.. I wake up, the time is 6.15 AM. Oh my gosh, It’s already late. Today I missed my exercise time and yoga. Suddenly I gather my thoughts on quick check list of what I am going to do today. I told myself OK, you can do it. Let’s make a quick breakfast, get the kid ready, prepare a fine lunch, get your things packed, send husband to office and kid to school, finally running and getting ready for office. Oh. I forgot to call my sister to wish for her birthday. OK let me do it once I reach the office. Oh God, this traffic eats my mind always. Finally at office by 9.30. Boss already arrived. In next 15 mins, I am going to have quick meeting on what task I am going to work on. Grabbing a cup of coffee and running towards the meeting room. OK, hey everybody good morning!! A Big smile on few people face and few were thinking of something else. Meeting went well. Now it’s time to prepare on my upcoming seminar, upcoming meetings and client calls. A friend of mine suddenly called me, hey what’s up dear, seems busy. I said with a smile, yea regular stuffs. Oh it’s already 1.00 PM I do have some meeting at 2.00PM, Let me grab my lunch soon. I told my colleagues, Hey Guys you carry on, I will join you all within 5 mins. By the time I reached they all almost finished their lunch. I told them again its OK, you guys carry on. I will have my lunch and come. I missed my fun lunchtime with friends. During my meeting my mom called me twice. I text ed her saying I am in meeting, I will call u later. Suddenly I remembered today my daughter has a rehearsal for her upcoming performance at her school and I need to pick her at 6.00 PM. After the meeting I kept myself busy in getting the task done. My phone rings it’s from my daughters mentor. I realized its already 6.10 PM. Oh my god she must be waiting for me. I spoke to her and my daughter. I told them I will be there in another few mins. I missed to pick her on time. She must have been worried. We reached home. We had some snacks together and worked on her home work for some time. I realized I missed to send an important email to my client. I opened my laptop, sent the email. Now husband reached home. Prepared dinner. Again cell phone is ringing. Its Mom, she said I have been calling you. Why didn’t you pick my call? I told her I was busy and I forgot to call her back. By the time I finished my call. My daughter already slept. My appetite is already gone. I cleaned the dishes and I started thinking again, I have to get the vegetables tomorrow, need to finish the left over work at office tomorrow, Need to call my uncle tomorrow to find out how is his health now. Lots of work for tomorrow. It’s already 10.00PM. After sometime I got a message from my sister, Hey sweet sis. Hope you had a great day and myself too. How is my niece? Had your dinner. I know you are completely occupied with all your work, But I wanted to remind you to wish me for my birthday. You never missed to wish me. So do it before 12.00. She had put a smiley at the end. I took a deep breath and I felt bad that I missed something really important that makes my sister happy. I called her and I wished her. She is totally sweet, she understood and I listened to her of what she had done on her birthday. She was so excited. We spoke for half an hour and the time was already 11.30 PM. Ok now I have to go to bed. I missed lot of things to do today, as a part of my regular work but I missed one big thing above all, that’s nothing but myself. Yes, I love to do my morning exercise and yoga, I love to eat at least one time in a day with family. I love to spend time with kids and play with them. I love to take a small walk on evening time with my husband. I like to do paintings. I love the time I spend with my mom and sister. A nice chat with a friend. These were not part of my regular day. I missed myself today!! Great post! It happens more often these days that the day gets busy and things slip, including ourselves.